As Sydney Dragway prepares for the East Coast Thunder on 4th and 5th November, the 400 Thunder Drag Racing Professional Drag Racing Series have announced an expanded television package for season 2016-17. Fox Sports have increased their commitment to the 400 Thunder Series Television Show, with a total of 100 hours now dedicated to 400 Thunder scheduling. This decision has been made off the strong ratings from the inaugural 400 Thunder season in 2015-16, which saw individual categories receive their own dedicated show from each event for the first time in a number of years. The new 400 Thunder Television Show will deliver 6 Hours of guaranteed exposure per category, giving each professional bracket a new 1 hour show per Championship round. The show will also be replayed a minimum of twice over the same week in different timeslots to ensure that it reaches as many viewers as possible. Discussions are currently being conducted to expand the International Broadcast Rights for the 400 Thunder Television program, and have received extremely positive receptions in negotiations with regions of economic significance and high population base. Already, the East Coast Thunder has been boosted with strong professional fields. Top Fuel will boast 7 Dragsters including Larry Dixon from the US, and the Inaugural 400 Thunder Top Fuel Champion Damian Harris racing out of the same stable in Rapisarda Autosport International. 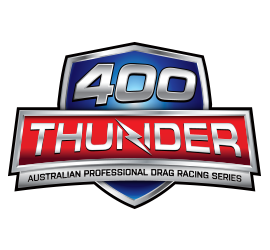 A host of big names will take to the track in all of the 400 Thunder Professional Drag Racing Series Classes, and will be well supported by the great racing that is sure to come from the 400 Thunder Sportsman Series. The East Coast Thunder also sees an new addition to the schedule – an autograph session on Friday evening at 6pm and the AEG Powertools “Hour of Power” final qualifying session at 6.45pm Friday. The East Coast Thunder is ready to deliver Drag Racing fans great enteg Series, and the second round of the 400 Thunder Sportsman Series. The event on the 4th and 5th of November is the first opportunity to see Top Fuel this season, and promises to be a spectacular event. Tickets are on sale now from $10 pre-purchase. Corporate packages are also available. For event information please visit www.sydneydragway.com.au or visit they Sydney Dragway Facebook page, www.facebook.com/sydneydragway .